The Mercedes-Benz W110 is a classic sedan from the mid sixties and has gained the nickname Heckflosse (German for Fintail). Technically, the rear fins were called peilstege (German for sightlines) and weren't designed for aerodynamic stability, but to help the driver find the ends of the car when backing up. A decent running/driving example with nice paint for less than $4k seems almost too good to be true. You be the judge. 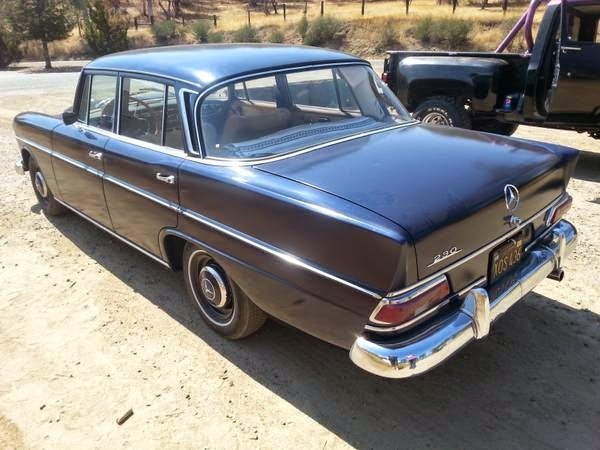 Find this 1967 Mercedes Benz 230 offered here on craigslist for $3300 located in Fresno, CA. Tip from FuelTruck. This 230 sports basic steel wheels, vintage badges on the grill and California black plates -- what more can you ask for in a cheap mid 60's sedan? Mercedes produced over 600,000 of these tanks and you can find plenty for sale, but the price/value ratio on this one looks good from afar. The W110 230 is powered by the M180, a 2.3 liter single overhead cam inline-6 cylinder engine that makes 120 horsepower when equipped with twin Zenith carburettors. It would be nice to see a 4-speed manual transmission, but at this price you can settle for the automatic. Fresno. Th stepside in the background looks like something Ponch and Jon would get picked up in after work. You know, by the ladies. Money pit with a slush box !